The Lions released Ayers on Tuesday. Analysis: Ayers had just signed with Detroit on Monday, so his early dismissal is surprising. The veteran defensive end will have a little over a week to find a new employer before the regular season gets underway. 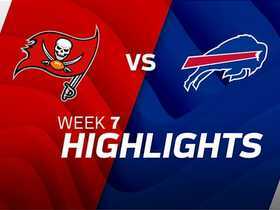 Analysis: Ayers started 10 games for the Buccaneers in 2017, making 31 tackles and two sacks. He was cut in March after the team signed Vinny Curry and later traded for Jason Pierre-Paul. Ayers will likely work in a reserve role with the Lions, but he can rotate between pass-rushing and run-stopping situations. 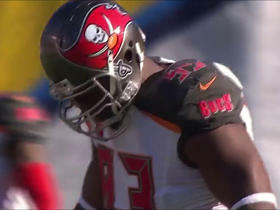 Ayers (shoulder) was released by the Buccaneers on Saturday, Field Yates of ESPN reports. Analysis: Ayers started 10 games for Tampa Bay last season and registered 31 combined tackles to go along with two sacks. At 32 years old, Ayers still has some juice left in the tank so it's expected that he'll garner some suitors for his service. Just how much juice is left in the tank remains to be seen, however. Ayers (shoulder) is listed as inactive for Sunday's game against the Saints, Scott Smith of the Buccaneers' official site reports. Analysis: Ayers has accrued 31 tackles (20 solo) and just two sacks this season. The veteran defensive lineman will miss his fourth game of the season, and Ryan Russell will fill in for the time being. Ayers (shoulder) is listed as doubtful for Sunday's game against the Saints, Jenna Laine of ESPN.com reports. Analysis: Ayers was a limited participant in practice this week, but it appears the team is exercising some caution with its starting defensive end. Patrick O'Connor and Will Clarke should both see increased workloads Sunday with Ayers unlikely to suit up. Ayers (shoulder) was limited in Wednesday's practice. Analysis: The veteran defensive end missed the entirety of Week 16 prep with the stinger he'd suffered against the Falcons in the prior contest, so his return Wednesday, even in a limited capacity was a good sign. Further insight into Ayers' chances of suiting up for the regular-season finale will be gleaned from the final two injury reports of the week. Ayers (shoulder) has been ruled out for Sunday's game against the Panthers, Jenna Laine of ESPN.com reports. Analysis: Ayers was unable to practice throughout the entire week and is now slated to miss his fourth game of the season. During his upcoming absence, Patrick O'Connor could draw the start at defensive end with Will Clarke also providing additional depth. Ayers (shoulder) did not participate in Wednesday's practice, Jenna Laine of ESPN.com reports. 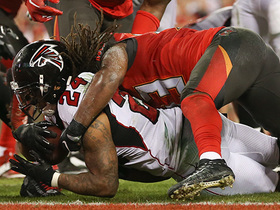 Analysis: Ayers was one of multiple Buccaneers defensive players to exit Monday night's 24-21 loss to the Falcons due to injury. The play that Ayers was sidelined on also resulted in linebacker Adarius Glanton suffering a lower leg fracture, so the former escaped the incident comparably unscathed. However, the after-effects were still enough to keep Ayers out of practice for the initial session of Week 16 prep, with another update on his condition slated to come with Thursday's injury report. 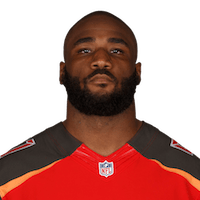 Ayers failed to return to Monday's 24-21 loss to the Falcons after suffering a stinger in his neck/left shoulder, FloridaFootballInsiders.com reports. He finished the contest with one tackle and a forced fumble. Analysis: The defensive end suffered the injury when he collided with teammate Adarius Glanton while both were attempting to take down Falcons quarterback Matt Ryan. Both Ayers and Glanton exited the contest as a result, though Glanton absorbed the brunt of the hit and suffered a lower left leg fracture that will end his season. The Buccaneers will see how Ayers progresses over the next few days before determining his status for the Week 16 matchup with the Panthers. Ayers is considered questionable to return to Monday's game versus the Falcons due to a neck injury. Analysis: Ayers exited the game late in the third quarter after suffering the injury. He had posted one solo tackle during his time on the field. Expect an update on his status once the team provides more information regarding the extent of his injury. Ayers (concussion) posted two solo tackles -- one for loss -- in Sunday's 24-21 loss to the Lions. Analysis: The veteran defensive end returned from his two-game absence and managed at least two tackles for the sixth straight game. Ayers is currently posting his lowest sack total (2.0) since his 2012 campaign in Denver, but his pair of stops against the Lions allowed him to eclipse the 29 tackles he'd amassed in his debut campaign with the Buccaneers in 2016. Ayers turned in a full practice Thursday and has cleared the NFL's concussion protocol, Scott Smith of the Buccaneers' official site reports. Analysis: Ayers' full participation in practice Wednesday hinted that the worst of the concussion was behind him, and his removal from the protocol a day later indicates that he received clearance from an independent neurologist to play Sunday against the Lions. With 28 tackles and two sacks across 10 games this season, Ayers isn't a major IDP asset, but he's viewed as a key rotation player along the Bucs' defensive line. 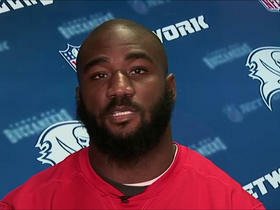 Ayers (concussion) was a full participant in practice Wednesday, Jenna Laine of ESPN.com reports. Analysis: Ayers' unrestricted participation was certainly encouraging after a two-game absence, but head coach Dirk Koetter also emphasized that the veteran defensive end is yet to be cleared by an independent neurologist. More definitive news on that aspect of Ayers' recovery should be available in the coming days. Ayers (concussion) is listed as out for Sunday's Week 13 tilt against the Packers. Analysis: The veteran pass rusher will miss his second consecutive game, as he's apparently yet to clear the league-mandated protocol for head injuries. Ryan Russell is likely to draw the start in Ayers' stead, while Patrick O'Connor, who was promoted from the practice squad last Tuesday, should see a solid amount of snaps in the rotation as well. Ayers (concussion) won't play Sunday against the Falcons, Roy Cummings of WFLA NewsChannel 8 reports. Analysis: Ayers has 28 tackles (17 solo) and two sacks this season, and he would have been helpful in keeping pressure on the league's seventh-ranked pass offense. William Gholston (neck) will be back for Sunday's game, though, which will shore up the edges of the Bucs' defensive front while Darryl Tapp and Ryan Russell play in Ayers' place. Ayers (ankle) doesn't carry an injury designation heading into Sunday's game against the Dolphins, Adam H. Beasley of the Miami Herald reports. Analysis: While he was battling the same ankle injury, Ayers was deemed questionable heading into the Week 10 win over the Jets, ultimately suiting up and supplying three tackles across 48 defensive snaps in the victory. With Ayers coming out of that contest no worse for the wear and turning in a full practice session Friday, he should be on tap for a full workload in the interstate matchup Sunday. Ayers (ankle) posted four tackles (all solo) and one sack in Sunday's 15-10 win over the Jets. He compiled four quarterback hits overall. Analysis: The veteran defensive end played well while nursing an ankle injury for the second straight week, as he's now compiled nine tackles, two sacks and a forced fumble over that span. Ayers has all three of his quarterback takedowns on the season within the last four games, and his 26 tackles through nine games leave him just four short of eclipsing the 29 he posted in his first Buccaneers season in 2016. Ayers (ankle) is active for Sunday's Week 10 tilt against the Jets, Scott Smith of the team's official site reports. Analysis: As he did Week 9, the veteran defensive lineman will fight through his ankle injury and attempt to slow down veteran signal caller Josh McCown and a running game that will be helmed by Bilal Powell, with Matt Forte (knee) taking a seat this week. Ayers (ankle) is listed as questionable for Sunday's matchup versus the Jets. Analysis: Ayers fought through an ankle injury in Week 9, and ultimately recorded a season-high tackle total to go along with a sack. The veteran defensive end was held out of practice earlier in the week before logging a limited workload Friday. It is unclear if the team is just exercising caution with Ayers during the week or if the injury is a serious threat to his status for Week 10. Darryl Tapp would presumably fill in at defensive end should he be unable to go. Ayers (ankle, calf) did not participate in Wednesday's practice, Jenna Laine of ESPN.com reports. Ayers (ankle) tallied six tackles (five solo) -- including one sack -- and forced a fumble in Sunday's 30-10 loss to the Saints. Analysis: The veteran defensive end fought through his sore ankle to post his second sack of the season, both of which have come in the last three games. Ayers' forced fumble was also his first of the season and rounded out a productive afternoon in which he also notched a season high in tackles. The 32-year-old brings plenty of pass-rushing ability to the table in addition to being a solid run-stopper, so he remains a serviceable IDP option in deeper formats. Ayers (ankle) is active for Sunday's Week 9 tilt against the Saints, Scott Smith of the team's official site reports. Analysis: The veteran pass rusher will be available to get after Saints quarterback Drew Brees and attempt to slow down the vaunted two-headed rushing attack of Mark Ingram and Alvin Kamara. Ayers wasn't added onto the injury report until Friday -- a day in which he was still able to turn in a limited session -- so it doesn't appear that the ailment is overly restrictive. Ayers has an ankle injury and is listed as questionable for Sunday's game against the Saints, Greg Auman of the Tampa Bay Times reports. Analysis: Ayers dealt with back and knee injuries throughout October and was a late addition to the injury report this week as a limited participant Friday. There's no indication on the severity of the ankle injury at this point. Ryan Russell and Darryl Tapp are likely to see increased workloads if the 2009 first-round pick cannot play Sunday. 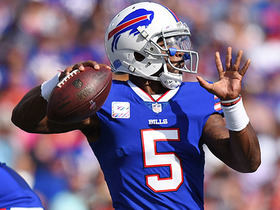 Buffalo Bills quarterback Tyrod Taylor finds wide receiver Deonte Thompson deep for 27 yards. 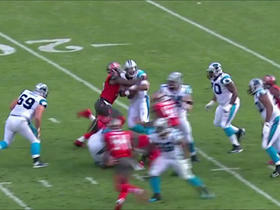 Carolina Panthers quarterback Cam Newton sacked by Tampa Bay Buccaneers defensive end Robert Ayers. 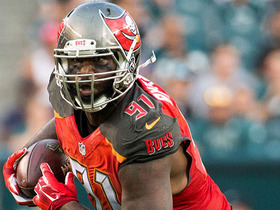 Tampa Bay Buccaneers defensive end Robert Ayers discusses a Week 15 matchup with the Dallas Cowboys, the strength of the Bucs' defense, quarterback Jameis Winston, and his fashion. Tampa Bay Buccaneers defensive end Robert Ayers discusses his head coach, Dirk Koetter, musician and Bucs superfan Nick Carter, and his college teammate, Kansas City Chiefs safety Eric Berry. 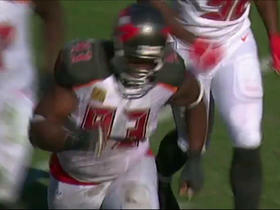 Tampa Bay Buccaneers defensive lineman Robert Ayers brings down quarterback Philip Rivers. 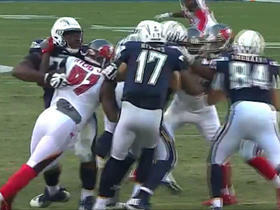 Tampa Bay Buccaneers defensive linemen Gerald McCoy and Robert Ayers team up to sack Philip Rivers. 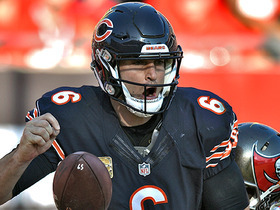 Chicago Bears QB Jay Cutler is sacked, fumbles, is ruled a safety. Chicago Bears QB Jay Cutler sacked by Tampa Bay Buccaneers defensive end Robert Ayers and defensive tackle Gerald McCoy for a 7-yard loss.